The first book of its kind in the new science of posttraumatic growth: a cutting-edge look at how trauma survivors find healing and new resilience The uplifting science of posttraumatic growth presents groundbreaking research and proven methods to survive and thrive in the face of challenges. Twelve inspiring role models share their profound insights on how they emerged from hardship stronger, wiser, and more compassionatefrom civil rights icon Maya Angelou, who healed deep childhood trauma; flight surgeon Rhonda Cornum, who found a new purpose after being captured in Iraq; renowned autistic pioneer Temple Grandin, who overcame crippling panic attacks; and famed jazz guitarist Coco Schumann, who played for his life in Auschwitz. In Bouncing Forward, Michaela Haas draws upon powerful storytelling, psychology, history, and twenty years of Buddhist practice to reshape the way we think of crisis. Unlike books from the medical community, Bouncing Forward is a user-friendly source of techniques that actual trauma survivors have used to benefit from pain and adversity. Haas draws on common coping threads to beautifully combine inspirational stories of growth through trauma with science and spirituality. Perfect for people from all walks of life who are recovering from loss, pain, illness, or violenceas well as their friends and family. 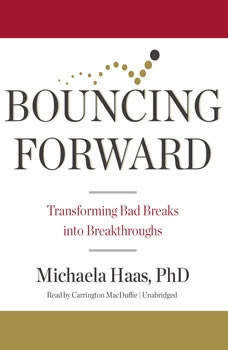 Bouncing Forward offers examples and inspiration for growth and a mindful approach to finding a deeper meaning in life.